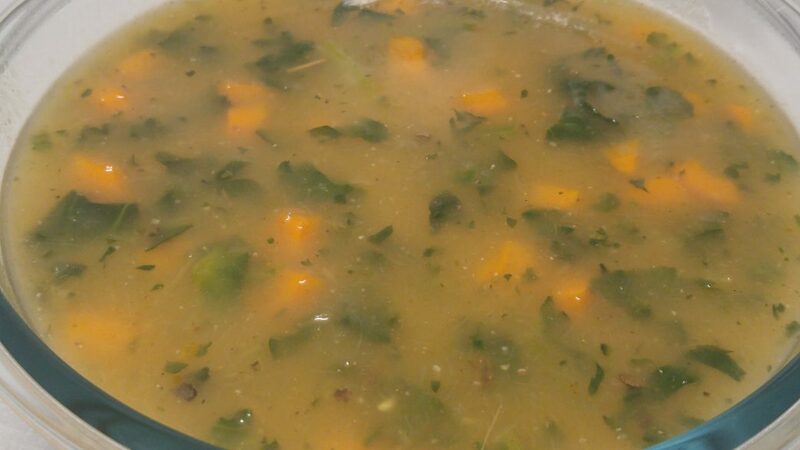 This is my take on the classic squash soup. As I am posting this in the fall, I used orange peppers to represent the change of seasonal colors. Spinach adds a nice color contrast as well as flavor to this comforting cold night dish. There are many ways to cook a spaghetti squash. I prefer this method. Place the whole squash on the middle rack of a 400-degree oven and bake for 50 mins. The bottom side of the squash will get a little dark but that’s ok, it’s what we want. After 50 minutes, carefully remove the squash and place on a cooling rack or sheet pan. Using a knife, poke holes around the squash. This will release some of the heat while it’s cooling. Let cool for about 30 mins. While the squash is cooling, add 4 cups of veggie broth and the ½ of a chopped onion to a medium pot. Bring to a boil, then turn off the heat and cover the pot. Once cool enough to touch, cut the squash in half lengthwise. Use a fork to remove the seeds. You will notice that using this technique, the skin of the squash will be brittle and can easily be peeled off. Slice the squash up into rough pieces. Add it to the soup pot. Using an immersion blender, blend until smooth. If you do not have an immersion blender you can blend it up in a regular blender. Add the remaining ingredients and simmer for about 10 minutes. Will make 4 large meal sized portions or 6 side soup portions.